“Simple Witness” by Bob Siqveland is an entertaining mystery/thriller that will have you glued to your seat! When Harold Bartz (Bandit) witnesses a murder, he flees to Las Vegas, where he is soon joined by his friends, Banger and Diggs. Jethro Plack sends a couple of Russian hit men to find Bandit in Vegas. Plack is a devious telemarketer who scams money off his unsuspecting customers. Plack’s scam, the Fortune Fate Lottery, soon gains the attention of St. Paul Police Lieutenant, Sean O’Dell. At the same time, CJ Johannson, a Minneapolis cop, is assigned to a suicide case that doesn’t quite fit the profile of a suicide, and soon clues lead him back to Plack. When Plack’s own thug, Tommy Ling develops a conscience and becomes uncomfortable scamming the innocent, he creates his own plan and becomes the Robin Hood Hacker. When Bandit comes out of hiding, Lieutenant O’Dell finally catches Plack and puts him behind bars. However, what sort of surprise do Bandit and his friends encounter in Vegas? Confused yet? Admittedly, that is how I felt after reading the back cover, and this book has a lot going on, with multiple characters. But take heed, each chapter is told from the point of view of one of the characters, making this a very entertaining read. I am typically a fan of this style of writing because it makes the story more clear, at least to me. The writing is engaging and the characters are all well developed. Through the background and depth provided, I was able to form a very strong opinion of all parties, whether I liked them, or not. The settings, descriptive and realistic, added another layer of engagement for the reader. 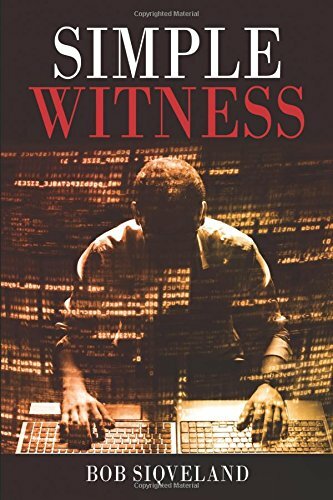 I recommend “Simple Witness” by Bob Siqveland to all mystery/thriller fans. Don’t be fooled by the name – it’s not simple, but a well-written action-packed adventure, perfect for a rainy day or quick escape.